A reader wrote to ask me about Tina Nichols Coury's Hanging Off Jefferson's Nose: Growing Up On Mount Rushmore, a new picture book about the father and son who carved Mount Rushmore. Gutzon Borglum started carving what we know today as Mount Rushmore, and when he died, Lincoln (his son) finished the project. In character as “The Rushmore Kid” she [Coury] visits schools across the United States to present her popular "Why I Love America” program, which promotes an understanding and appreciation of the essential qualities that make America great. I understand and appreciate love of ones nation, but we ought to be critical of the things about America that are not great, too. Mistakes made by America's leaders, for example, must be something that children learn, and there are plenty of mistakes made with regard to the ownership of the Black Hills and Mount Rushmore. I'll start by noting problems with Sally Wern Comport's illustrations. She shows several men dancing around a fire in a stereotypical way. The man in the foreground on the left is playing a drum with his open palm. That is an error. Native peoples across the United States use a drumstick to play the drum. I'd like to know what the source for the drawing was because old black/white silent-film footage of the time shows some Native dancers at an event at Mount Rushmore. It was during the day, not at night, and the dancers weren't dancing around a fire. 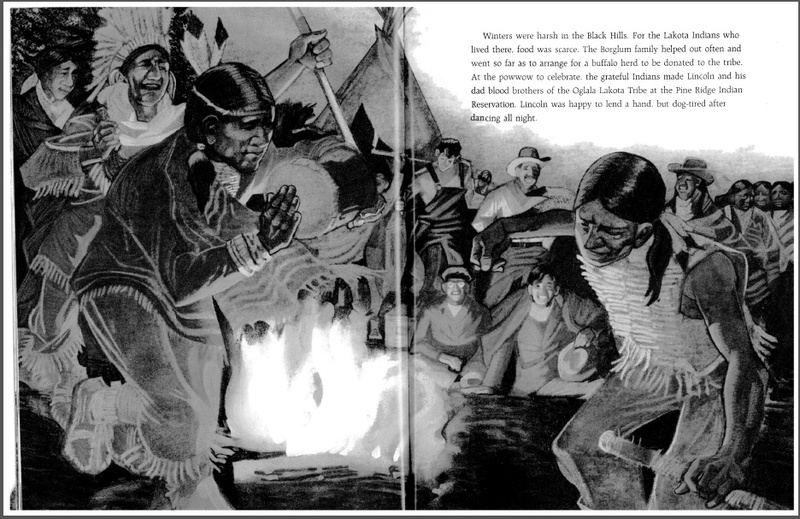 In fact, I've never seen Plains Indians dancing around a fire, except in stereotypical drawings by non-Native artists. Winters were harsh in the Black Hills. For the Lakota Indians who lived there, food was scarce. The Borglum family helped out often and went so far as to arrange for a buffalo herd to be donated to the tribe. At the powwow to celebrate, the grateful Indians made Lincoln and his dad blood brothers of the Oglala Lakota Tribe at the Pine Ridge Reservation. Lincoln was happy to lend a hand but dog-tired after dancing all night. They had a powwow to celebrate? Again, I'd like to know the source of that information. In The Great White Fathers: The Obsessive Quest to Create Mount Rushmore, John Taliaferro writes that the Borglum's provided a herd of cattle (not buffalo) and blankets and that the Oglala's were grateful to him and held a ceremony at Pine Ridge during which they made him an honorary member. Taliaferro also writes that Borglum wanted buffalo meat served at the dinner, but his efforts to hunt and kill one didn't work out. Was the ceremony a powwow, as Coury describes? Did they dance all night? Was there a fire that they danced around? The text prompts other questions... Why was food scarce? Was it scarce for everyone, or, did this scarcity have something to do with policies of the federal government? Without sufficient context, the Oglala's are portrayed as pitiful and in need of rescue by kind hearted whites. I'll keep looking for other accounts. Presumably, Coury has one that says it was a powwow and that they Oglala's made the Borglum's "blood brothers". Is it a Native source, I wonder? "When Boone is better, do you know what you're going to do? You're going to make him your blood brother!" Little Bear shot him a quick, startled look. "Blood brother?" "You both make cuts on your wrists and tie them together so the blood mingles, and after that you can't be enemies ever again. It's an old Indian custom." Little Bear looked baffled. "Not Indian custom." "I'm sure it is! It was in a film I saw." "White man idea. Not Indian." "Well, couldn't you do it, just this once?" Banks apparently knew it was not legit. Too bad she didn't get the larger problems in making a Native man under complete control of a white boy. Anyway! I recommend libraries not order Hanging Off Jefferson's Nose. Some people argue that you can't reject a book for what it leaves out (in this case, the context by which the Black Hills were taken from the Lakota people), but you can reject it for stereotyping. Based on this page, I'd save my libraries money and buy something that doesn't put a librarian into the position of having to say "this page is wrong..." when she reads it to a group, or checks it out to a student. Wow! Debbie, you do realize this is a childrens book. I read it to a few neighborhood kids who never heard the story. Until your revelation, I am amazed that not 1 Indian ever tapped a drum with his hand. If you have children, how do you ever take them to a movie or read them a childrens book? Dr. Seuss, no, doesn't use proper english. How about a Disney movie, The Lion King or Bambi? Nope, Animals can't speak. I believe that the author is trying to tell a story without getting involved in politics. Maybe you should try the same. I really hope you are not a librarian. I especially really hope you are not a children's librarian! Comparing Dr. Seuss' improper English to the attempted genocide and continued cover-up that these stereotypes encourage shows your lack of concern for populations other than your own. Nice choice with the Disney movies because it sounds like you live in one (singing zip-a-dee-doo-dah, zip-a-dee-ay). I'm not even sure why you are on this site at all. Do you even know what this blog is about? Though I didn't personally know about American Indians not playing drums with their hands, when I clicked on the link showing the page I certainly smelled that stinky rat about the white man (of which I am one - all too often sorry to say) helping the natives when their food was scarce. Yeah, right. The Lakota just didn’t know how to survive those harsh winters… for centuries! And your ignorant plea to leave politics out of this?! Are you kidding me? Perpetuating this white-man-as-savior/everyone-else-is-weak-and-inferior garbage is extremely harmful. And subversively political!!! Yeah, let’s start teaching this to kids at an early age. Great idea. Thank goodness for Debbie Reese trying to educate us all. It’s called discourse, Anonymous. It’s how we progress and better serve all of humanity. Or are you just the lazy author of this book? Angry Children's Librarian, Thanks for the kind words! Sheesh!! This is a children's book about a family who spent lifetimes building a National Monument. Maybe the author wanted to convey a story without getting into the political scene. I am not a librarian, just a parent, but I believe you can tell an American story without getting involved in the political aspect. I can tell from your reply that you believe that this book should have educated a group of eight to ten year olds about genocide. How about we just convey the story and let them learn later on about the plight of the Indians. Maybe you rely on Debbie Reese to educate you, but I will take a pass. "stinky rat about the white man". Wow! Didn't think raciam would be brought into this conversation. Racism,genocide and cover-ups, that is not why I bring children to libraries for story time. I am neither the author or lazy. Funny, a government employee calling someone lazy. I absolutely realize this is a children's book. I don't think you realize that children's books reflect the values and politics of the author and/or society and time period in which the author is writing. Sometimes, the author is aware of the ways in which his or her politics impact the book he or she writes. Sometimes they are not aware of it, but the point is, the politics IS there, whether we realize is or not. It is referred to in educational theory as the "hidden curriculum." In other circles, it is called "an agenda." When your personal values are reflected in the work, you tend to like the work itself and see it as apolitical. When the author (or critic) is challenging your values, you tend to call it political. Again---the point is, there is ALWAYS an agenda. It is only called "agenda" when it is not your own agenda. But the politics are always there. I think it worth knowing that the father of the family was in the Ku Klux Klan, don't you? Maybe, when the Klan kicked him out of the KKK, he rejected their values and decided to do a monument reflecting America's presidents, or, maybe he was just being opportunistic. I really don't know... But I do think it important that we teach children about people in the fullness of who they are. In recent decades, there was a shift in the ways that biographies were being written, with heroes being shown in that rounded way, rather than as flawless individuals who are SO FLAWLESS that they are impossible to emulate. I was sorry to see this disagreement over a book turn into an attack against public librarians. Since the economic downturn, public libraries have been busier than ever, at the same time that their resources have decreased. During these difficult times, public librarians have been instrumental in providing tools and assistance for thousands of people seeking jobs. While parents are a child's first and best teachers, public libraries have proven to be very effective partners in preparing young children for school and reading. In addition, research has shown that participation in a free public library summer reading program staves off summer learning loss and helps close the achievement gap. Is AICL an organization or one person espousing views? What are the standards? What are the assurances that reviews are rendered with careful deliberation by knowledgable people? There definitely is a need for an organization that reviews ALL American Indian literature, but this site appears to serve as a platform for one person. AICL is primarily one person (me), but you'll also find items written by others, and, that I point to items written by others, too. On the "About" page you'll learn who I am: Tribally enrolled, former schoolteacher, PhD in Education, former professor in American Indian Studies, reviewer at Horn Book and SLJ, author of articles and book chapters. You'll also find information about who links to AICL. In short, I've got a lot of credibility and respect in the field of children's literature, education, and library science. For a lot of people, my work is unsettling because it challenges the dominant perceptions of who American Indians were, and are... Those perceptions are primarily based on outsiders portrayals of us, most of which are stereotypes and erroneous due to lack of knowledge of who we are. My work is based on the sort of research done in research universities, where the researcher (me) spends a great deal of time examining history and context of a work (children's book). And, if you've had a chance (since posting your comment) to look over the site, you may have ascertained that my focus is on the accurate/inaccurate presentation of the ways American Indians are portrayed. My "standard" is accuracy of the portrayal. Can a single page in a book (like HANGING OFF JEFFERSON'S NOSE) mean I won't recommend it? That might seem harsh to you, but I'd like you to consider a Native child in a library, repeatedly coming across incorrect or stereotypical depictions in books that are not categorized as "American Indians of North America" or similar categorizations. My research shows that readers are more likely to come across a misrepresentation of American Indians in any book than they are to come across one that accurately portrays American Indians. It might seem a small point to most people, but research shows that American Indian students disengage from school and drop out at higher rates than other students. Researchers point to the lack of culturally accurate or culturally inclusive curriculum materials that could keep them engaged. There are, of course, other factors at work, too, but it seems smart for all of us to optimize their experience in school by paying attention to that "one page" in a book like HANGING OFF JEFFERSON'S NOSE. Paying attention is also important for non-Native children. We don't really want to misinform them, do we? I am a teacher and student of children's lit and culture. I will tell you up front that I don't have all the answers. But my own experience has taught me that cultures cling to the narratives and stereotypes that are most useful to them. What's interesting to me is the fracas that results when people who cling to those stereotypes are shown evidence that they're false, that they run counter to history, that they are hurtful. Because I am an outsider to American Indian culture(s), I rely on AICL and Oyate (another excellent site) to navigate the children's lit resources that my students (all future teachers) and I encounter. And on a personal note, I appreciate the readjustments to my worldview that Debbie's work offers -- we are so bombarded with American Indian stereotypes in American culture that it is difficult to separate the legitimate from the propaganda. But it is not impossible. Finally, I would like to address Anonymous' comment about this being a children's book. We devalue and diminish kids and their culture in countless ways; one of them is by presenting "sanitized for your protection" versions of history. To present a story about Mt Rushmore that omits information about the creator's KKK membership is to whitewash -- literally -- crucial parts of the story. One way to read this act is to conclude that neither the writer, illustrator, editor, or publisher cared enough about Native American or African American history to get the story right. In other words, their histories are less important, less meaningful, less EVERYTHING than Anglo, mainstream, mass-marketed history. I hope that this wasn't the author's, illustrator's, etc. intention. But either way, we have a case of telling part of the story and leaving out critical pieces. There are ways to introduce this reading demographic to difficult historical issues, btw -- see Martin's Big Words by Doreen Rapaport & Michael Collier. It can be done. Apparently, it just wasn't done here. Hello, Anonymous. After typing in the first line of my Comment, I paused, rested my chin in my hand and read back my biting riposte to your comments. I've chucked that approach so that the core of my thoughts that took form while reading various considerations offered by librarian-commenters here about "Hanging..." had no interference or digression--an easy task that arises from their low-keyed & gracious tone to a subject which ranks not so very far beneath other well-studied atrocities committed upon Indians of the last 5 centuries. I thought to myself,"Whatever the purpose or equivocation, nothing about Mt Rushmore should be put before children other than as an exemplar of the notion that even marauding, genocidal conquest has an enduring capacity to run amok."